Fig. 11. ‘The Flood’ by Michelangelo (1510). Fig. 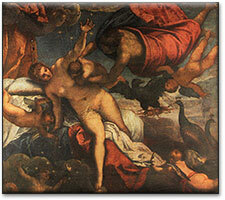 12.. ‘The Origin of the Milky Way’ by Tintoretto (1570). The High-Renaissance emphasis on figural perspective lasted for two centuries, but new impetus in art was given by the appreciation of the two-point, or oblique, perspective construction in the 18th century. Stimulated perhaps by the vivid angular perspective in Bibiena's theatrical scene-painting, artists such as Poussin, Canaletto and Piranesi made bold forays into new forms of perspective construction. Led by a few specialists from the mid-17th century, eighteenth century art finally discovered the flexibility to introduce vanishing point in any direction at the whim of the artist, making extensive use of the oblique perspective construction. The classical revival was under way, leading to the gothic style that characterized 19th century art. Once again, the geometric techniques of depth evocation played a role in the evolution of artistic aesthetics. Fig. 13. ‘Piazza San Marco - Looking Southeast’ by Canaletto (1735-40). 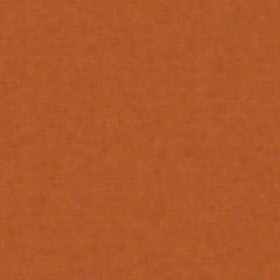 One example of the style (Fig. 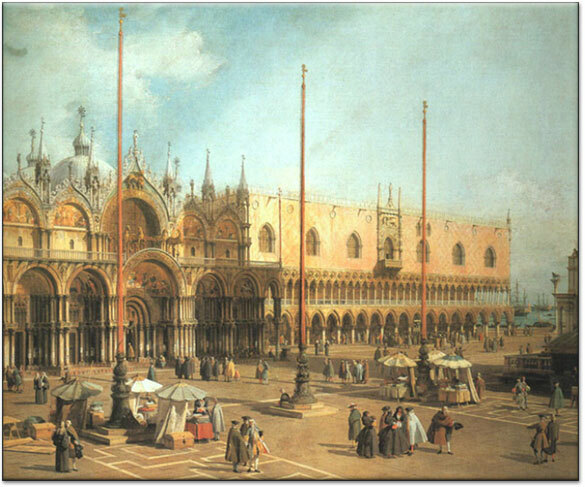 13) is the view of the Piazza San Marco in Venice by Canaletto, the Professor of Perspective at the Accademia in Venice. The buildings slope off to the right while the dominant lines in the Piazza converge to the left. The rhythm of the contrasting perspectives makes a pleasing counterpoint in the composition.